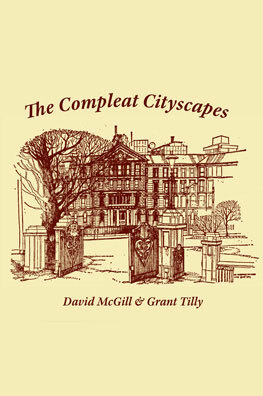 Pat Lawlor enthused about many Cityscapes subjects, including the atmosphere of the grand old Government Buildings, the Bolton Street graves and the charming summer house in the Botanic Gardens, the last vestiges of Chinatown, the still popular Thistle Inn where Te Rauparaha was an early patron, Tonks Avenue, Somerled House, Antrim House, Brittains Building, the Orient Private Hotel in Oriental Bay, before he ran out of space for more ‘recounting the memories that this delightful book has passed on to me’. 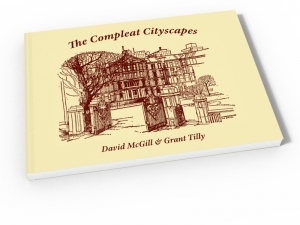 This is the first complete collection of the long-running series on the capital city’s physical heritage and those who built and lived in it, too much of it swept away in the name of perceived progress. The sum total of these articles is an informal portrait in picture and prose of almost a century and a half in the ebb and flow of a pioneer village growing into a vibrant port and nation’s capital, harvesting the memories of life in the humblest worker cottages and the grandest structures in the land. 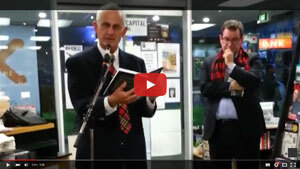 Pat Lawlor said no other New Zealand city produced the numbers of poets, artists and writers that exult in the character and charm of the place they reside in, from Katherine Mansfield all the way forward to McGill and Tilly carrying the torch for, among so many memories, those associated with the Mansfield homes. This is a book to treasure for all interested in the way we once looked and lived and how we grew to what we are in this breezy and beautiful little harbour city. ‘I lived in Wellington for half a decade back in the 60s and your stunning (enormous) book brought back many happy memories, a real burst of nostalgia!’ Graham Beattie, 16 May 2012. ‘Thank you for a lovely trip down memory lane.’ Alison Morgan, 12 May 2012. ‘A real landmark in Wellington history. It ranks up there with the iconic Streets of My City by Fanny Irvine-Smith.’ Bill Sheat, 18 May 2012. Cityscapes won the Cowan Memorial Prize for Outstanding Journalism. This handsome landscape A4 size publication of 497 pages with extra thick cover and cream art paper is available from author/publisher at discount on retail of $64-99 for $50 incl GST plus $8 packaging and postage.